Normally relying on the swim as one of my strengths it would be easy to think that blue green algae forcing the cancellation of the swim might not be my preferred scenario. However on this occasion I was glad to be going head to head with some other strong athletes over the 2.5km/40km/10km duathlon format, and was ready for a good battle. Some races are certainly more important than others and for the last few weeks I have definitely been preparing most for the Alpe D'Huez Triathlon which I'll compete in on August 2nd. Having said that, I'd done a thorough course recce for this event on a Racepace training day organised by Rodge, and when I arrived on Saturday lunchtime I checked the specifics of transition entry/exit points, and the finishing chute. It was a hot afternoon but the 14:30 start for the standard distance event made a change from the usual early morning kick offs. I was able to watch three Racepace teammates who were in the Sprint distance event setting off 10minutes before our race. As often is the case there were plenty of fast starters who soon began to struggle, even within the first few minutes, but I felt I did a good job of pacing the 2.5km run, gradually progressing from about 8th position to arrive back at T1 in 2nd position having run hard but feeling good to attack the 41km bike leg. I had a slick transition, and was soon running out of transition towards the mount line having leapfrogged into the lead. My tactic for the bike was to ride hard but smooth, and also practise using my new rear bottle cage which I will use in the long distance Alp d'Huez race. The temperature in the mid 20s was probably good prep for heading to France next month, and I could definitely feel myself sweating it out on the ride. During the early stages of the bike the lead athletes in the standard distance race were passing many of the sprint distance athletes so I had to keep my wits about me and tried to keep my own rhythm despite the chaos on the course at times. After 20km of the bike I was still leading and branched left to start my second lap, so knew that any other athletes on this section were in my race and I managed to glimpse there was still someone within 10 seconds behind me: "great we've got a race on our hands" I thought. 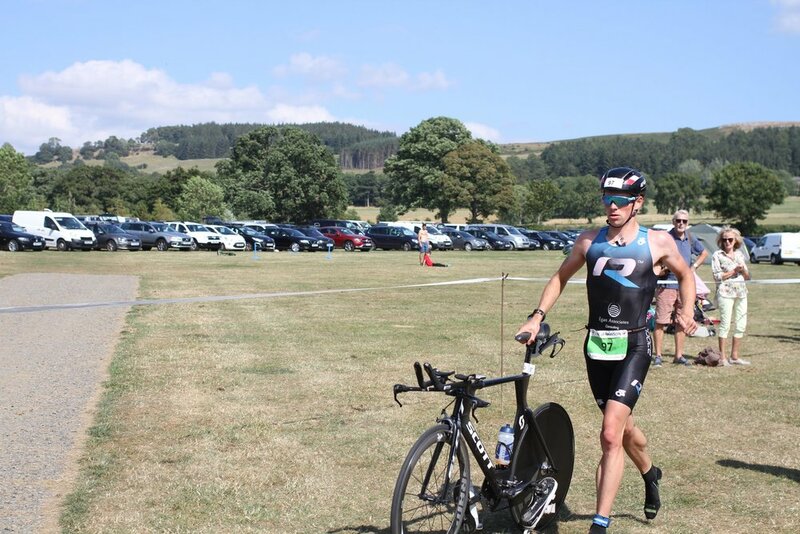 I pushed on as my tactic had always been to go hard on the bike and I held virtually the same pace on the second lap as the first, made sure I had my two gels at the right times, got through my liquids and arrived back at T2 with almost a minute lead! I headed out onto the run course in the heat of the day and once again there were plenty of sprint distance athletes to negotiate. The four lap course meant a wave of support every nine minutes or so as I ran past transition which was great. I focussed on holding good form and running as efficiently as possible. I finished off still maintaining at a solid pace and won the event by over two minutes, having run the quickest split of the day. Job done, time to relax and recover before the final build to Alpe d'Huez - bring it on! Four weeks into my association with Racepace and embracing triathlon as a sport, I was entering into my first triathlon event. As much as I was excited, the feeling of being able to complete the race with my desired finish time was consuming me. It was anything but a typical British inclement weather. The Sun shined bright and the optimistic rays only edified the mood of the event where scores of triathletes were gearing up for the start. The positivity from the warm and smiling people married with the generous race staff helped dispel my soaring nervousness. The spectacular Ullswater only strengthened my will to complete the race. Forty-five minutes before the race, Robert and Beau showed me around the transition area, where they selected the most visible area for my bike transition. I was making mental notes for future references seeing Beau, Robert and Samantha consolidating their respective transition times. As we neared the race, Samantha was kind enough to lend her race belt and I set for my warm ups. Between the race brief and the start, Rodge apprised me of the race experience and asked me if I had any goals for the race. Commence the race, the inexperience was noticeable as I started running strong and fast, trying to keep up with the myriads of top runners, but eventually found it difficult to stick with them. Only then, Rodge’s words ringed bells - where pre-race he insisted on going 5% slower if I ever feel weary. As I composed myself and let the adrenaline drive me further, I completed the first lap comfortably. Unlike other beginners, confusion escaped me in transition, thanks to good brief information provided by my Racepace crew. Surprisingly, I found my legs active as soon as I got on the bike. Pedalling constantly and avoiding my favourite coasting, I was able to bike smoothly through straight roads. On the first climb, my right lens popped out, which disturbed my rhythm. But the hunger to complete my first race was clearer than my lack of vision and I kept going. Thanks to me being an avid motorcyclist, I could corner fairly well as compared to fast pedalling on the straight roads. I felt my moment of pride when I overtook athletes on turns and down slopes, who, I can easily deem as better cyclists given they went past me effortlessly couple of metres back on straight stretches. Nearing transition, I unstrapped my helmet thinking I could save time in transition and catch up with the runners. It was then I was pulled up by the race official. However, I kept my calm, parked the bike, guzzled down some water and headed for my run. The tiredness in my legs was eclipsed by the spirited support of my Racepace crew. 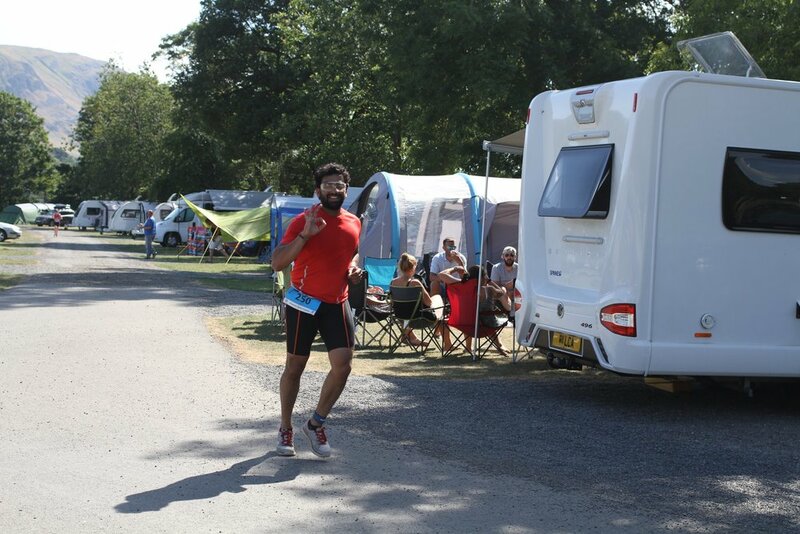 The first lap was not that gruelling, but as soon I jogged into the second lap, the various thoughts recoiled from the reason - I am doing triathlons to giving up to failing on my amour propre. Lost in my thoughts and running with a soaring incertitude, Beau went past me on the turn with pat on my back encouraging me to keep going. It was then I realised, I am close to the finish line and I need to complete it. Around 150 mts from the finish line, my crew was in sight and their animated vocals reversed my subdued enthusiasm. Samantha’s stimulation coupled with Rodge’s rallying fortified my mental sphere and I sprinted 100 mts to the finish line. Conclusively, I finished with a timing of 1:48:49 and was well ahead of my set goal time 2:15:00. The feeling of satisfaction and a sense of achievement engulfed me as my crew hugged and showered positive words. I looked up to the sky, thanked my parents, remembered my God and felt grateful. A few weeks back my demeanour was far cry from the present confident persona of being able to compete in triathlons. Now, post my first race, I am brimming with new found confidence and I look forward for my main event in September. My first triathlon, ok, duathlon thanks to the blue green algae, was nothing short of both thrilling and a learning experience. I am working on my physical conditioning for which I am following a good nutrition program along with my personalised training programs designed by Sarah. In the coming months, under the guidance of inspiring Sarah and the support of stimulating Racepace crew, I will come out stronger and faster!